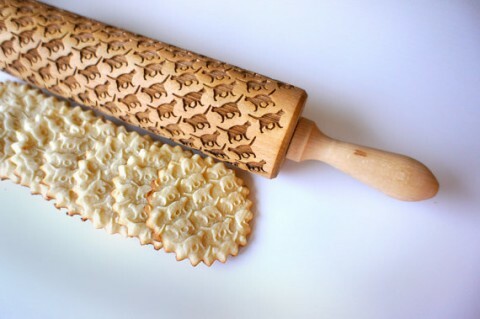 These engraved rolling pins made me smile. You can even get one custom made. Oh, the possibilities! Oh my gosh! We need these! At least 4 or five of them! :) Thanks for sharing! birthday gift for my mom: totally taken care of now. Thanks, Tina! 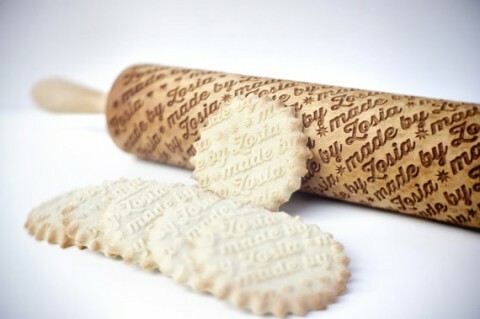 Shouldn’t the type be reversed on the rolling pin? Love it, Great! That’s creative and so darn simple! I love them.I have been a baker for all my life.My Dad was a great baker and worked as one all his life.If he was alive he would love these.It would be great to wight the name of the bakery on the cookies and put them on everything. As a graphic designer, a cook, and a lover of good ideas, i simply LOVE that!!!!! Can these be used on pizza dough also? So where do we get them? Where do you order a special one? how can order them fro india and what is the price? how can order them from india and what is the price? how can order them from india ? I need a pin that says Chateau Sauté. What would be the price and delivery time? Dear Sir/Madam- I am interested in contacting this person to see if they could make a rolling pin with fish like a salmon, trout or walleye on it. I welcome any contact direction.